It’s time to bring out the warrior in you, join the RTL CBS Extreme Spartan: Ultimate Team Challenge Facebook and Instagram contests to win exciting prizes from Fitness First and Urban Remedy. Fitness First will be giving away 1-year gym membership and personal training sessions to two lucky winners. 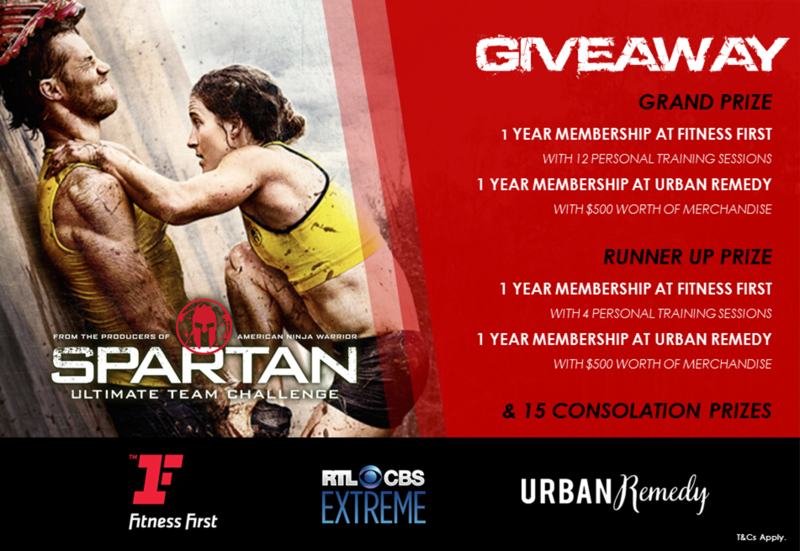 To join, like RTL CBS Extreme on Facebook, look for the post about the Spartan: Ultimate Team Challenge giveaway, and leave a comment with why you should win. For avid Instagram users, Urban Remedy will be giving away 25 sets of memberships plus $500 worth of merchandise! Simply follow @RTLCBSExtreme on Instagram, like and repost the Spartan: Ultimate Team Challenge giveaway photo, and tell us why you should win in the caption. Don’t forget to use the hashtag #SpartanRTLCBSExtreme. Contests are open to all Singapore citizens, permanent residents, employment pass, and work permit holders 18yrs old and above. Hurry and join before it ends on 14 May 2017. Participants are only allowed to send one entry so make it count! Good luck! Follow RTL CBS Extreme on Facebook and on Instagram for more details. Catch Spartan: Ultimate Team Challenge every Saturday, 9:30 pm on RTL CBS Extreme Starhub TV (Ch 428).